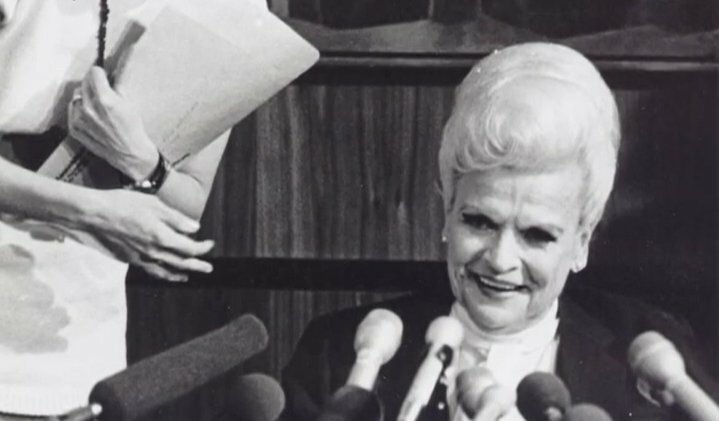 Rose Mofford during her time as governor of Arizona. A nearly 25-mile stretch of U.S. Route 60 will be named after Rose Mofford, Arizona's first female governor. The State Board on Geographic and Historic Names approved the proposal, which formally recognizes the route as "Governor Rose Mofford Memorial Highway." The stretch runs between Apache Junction and Globe. According to The Arizona Republic, a longtime friend of Mofford introduced the proposal in 2017. Mofford died in 2016 at age 94. The location of the newly named stretch of U.S. 60 is appropriate, as Mofford was a Globe native who famously was Globe High School's valedictorian in 1940. The next step in renaming the highway includes adding signs to introduce the new name to drivers. This could take a while, as fundraising may be involved. Mofford was secretary of state and took over as governor when Governor Evan Mecham was impeached in 1988; she retired in 1991 and dedicated her life to charity work. Long before her time as governor, she was the business manager for a little publication called Arizona Highways.